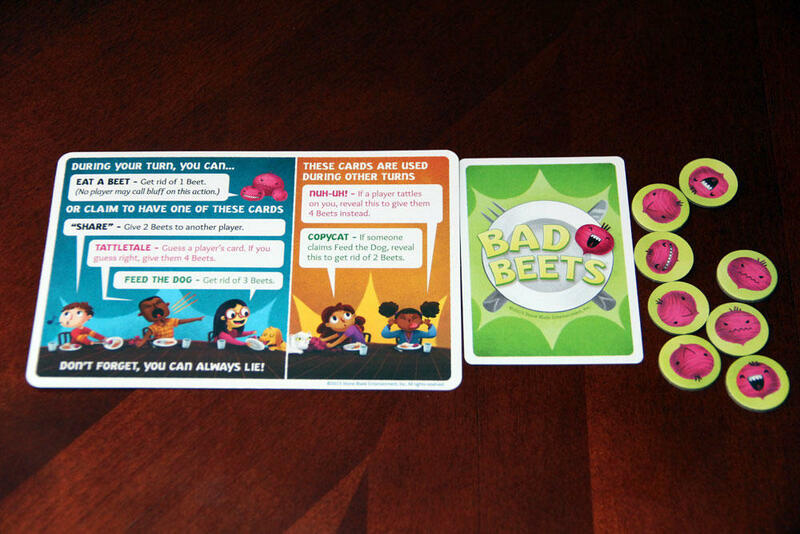 We review the family friendly bluffing game Bad Beets. In this quick playing game, players are trying to be the first to get rid of all their beet cards, sometimes stretching the truth to do so. There are many reasons I love board gaming. It allows a great deal of quality time with my family, especially my 9-year old daughter, who is probably my most frequent gaming partner. And she loves bluffing games. Her ability to fool me may be something I regret soon. Today, we are reviewing, Bad Beets a light-hearted, family themed bluffing game. 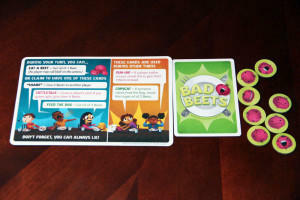 Bad Beets is a bluffing and deduction game for 2-5 players, 8 and up. I wouldn’t recommend ever playing with 2, and it really plays best at 4 and 5 players. In Bad Beets, players attempts to get rid of all of the beet tokens in front of them. This may involve feeding them to the dog, sharing them with another player, or eating them (ewww!). The main mechanic will be familiar to anyone who has played Coup, you can take any action, even if you don’t have the card that allows you to take that action. However, other players can call you out and you are penalized if you were bluffing. The game ends when one player successfully gets rid of all of their beets. Alternatively, if you wish to play a longer session, when you win a round you can claim an ice cream token and the first player with three ice creams wins! The components in Bad Beets were all high quality. Bad Beets could probably be classified as a microgame. The definition is a bit unclear, but the game only requires a deck of 15 cards and the aforementioned beet tokens and optional ice cream tokens. The box does include 5 handy player aids with a nice placemat designed to remind players of the actions available to them. For such a small and inexpensive game, it’s a nice surprise bonus I wouldn’t have normally expected. While the quantity is fairly low, the quality of the components is impressive. The punch-board tokens are fairly thick. The cards and player aids look great. The art by Liz Nugent is one of the highlights of Bad Beets. It is cartoony and whimsical and fun. Everything you want the art to be in a family game. 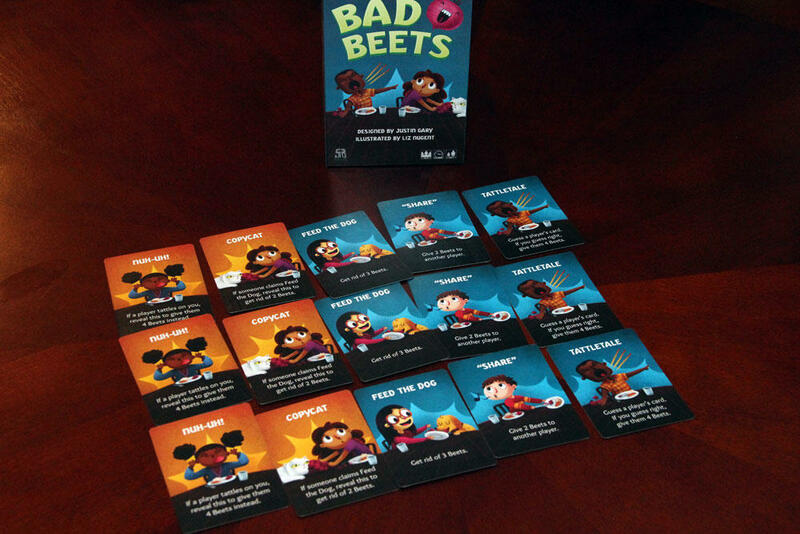 In Bad Beets each player starts with one card. The first player will draw a card, choose one to keep and pass one to the left. The passed card is not picked up by the next player until their turn starts. The player will then claim one of four actions: eat a beet, share beets, feed the dog, or tattletale. Learning to play Bad Beets is easy, especially if you’ve played other bluffing games. Eating a beet allows you to get rid of a beet, no questions asked. It’s painfully gross, obviously. But it is the safest way to remove beets from your plate. For the rest of the actions, to safely perform the action you must have the matching card. Sharing allows you to pass 2 beets to another player. Feeding the dog allows you to get rid of 3 beets. And to tattletale, you attempt to guess another player’s card and give them 4 of your beets if you are correct. Of course you can take any of the actions, regardless of what card you have. But if another player thinks you are bluffing, they can call you out. If you are caught, you don’t get to take an action and the player who caught you gets to get rid of a beet. If you call out a player incorrectly, you get an additional beet as a punishment. The Bad Beets deck also includes yellow reaction cards. These cards can be revealed when it is not your turn to perform an extra action. 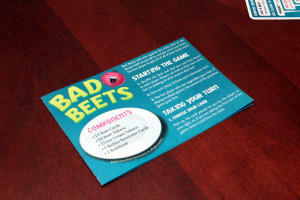 The Copycat reaction card allows you to discard 2 beets when another player claims to feed the dog. Similarly, the Nuh-Uh! card allows you to give a player 4 beets if they attempt to tattletale on you. Once the player’s action is complete and any reactions are played, the next player will pick up the card passed to them, choose to keep either their original card or their new card, and pass the other on to the next player. Play continues in this manner until one player is out of beets! Players will gain not only action cards, but also reaction cards that can be played out of turn. 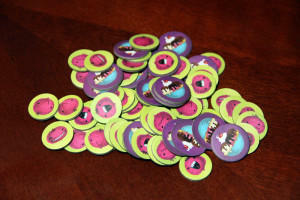 Bad Beets is a really cute bluffing game that is short enough, a round only takes about 10-15 minutes, to be enjoyable. But it has a number of flaws that make it really hard to want to continue to play it or to bring it back out to the table. My biggest problem with Bad Beets is that the penalty for “bluffing” is incredibly low. If you are caught in a lie in Coup you can find yourself eliminated entirely very quickly. In Bad Beets, there is no player elimination. In a family weight game, I can certainly understand the reasoning. If you are caught, you just don’t get to take your action. No extra beets for you. It just never makes sense to go the “safe” route of just eating a beet. The rewards for performing feed the dog or sharing your beets with another player is just too high. Also, the reaction cards add a bit of timing complexity and weirdness to the game overall. I would have much preferred just two more regular actions that could be taken. Only having three types of action cards available means there just isn’t a lot of variety. 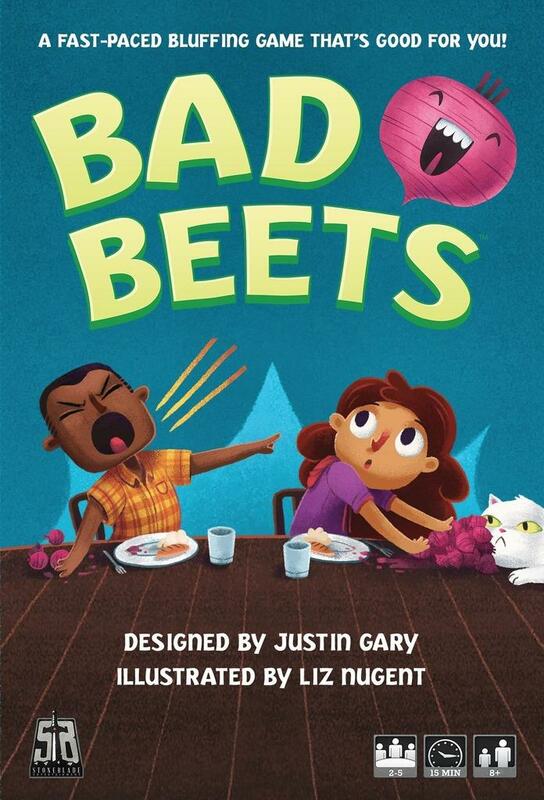 The rules and artwork in Bad Beets help to make it a family friendly game. I also think the mechanic of passing a card to another player just doesn’t add much to the game. It gives a lot of information to the players, especially in a 2 or 3 player game. If you passed a player a “Nuh-Uh!” card and they are claiming to have Feed the Dog, you have a great deal of information. And it really is just a bit fiddly, especially with younger gamers. Even experienced gamers are used to picking up a card when it’s passed to them. It’s instinctual maybe. More than a couple of times, we had to restart a round because a player picked up the card passed to them before the turn was over. There is a lot to like about Bad Beets. The theme is awesome, especially for families. The artwork really brings that theme to life. It’s an age-appropriate bluffing game for kids… assuming you don’t have qualms about teaching your children to lie to you. But there are too many shortcomings for me recommend it overall. If you think the theme will be a hit with your family or you’d like to play a bluffing game but your kids aren’t quite ready for Coup, Bad Beets certainly may fill that niche for you. For anyone else, I’d recommend sticking to the other bluffing and deduction games on the market. If you’d like to get a copy of Bad Beets for yourself, you can pick it up for about $10. 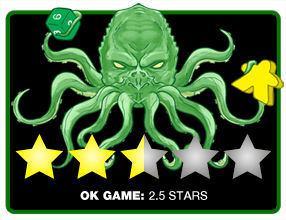 Final Score: 2.5 Stars – A great theme and stellar artwork help make this a light family game, however, it has too many things that could have been done better.